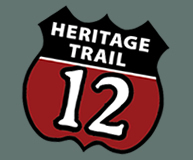 Anything can happen as you travel the US-12 Heritage Route. We would like to hear about your adventures. Sign up here to post your adventures! Once you have registered and/or logged in, go to the Share Your Stories page to tell us your story, or use the Share Your Story link on many pages to tell us a story about whatever is mentioned on that page. Read the adventures that others have posted! This page last updated on 10/17/2014.